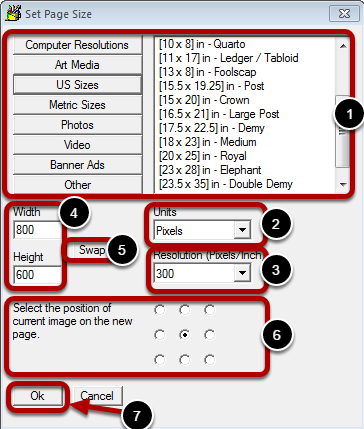 The top area of the Set Page Size dialog are shortcuts for common sizes. When you click a button on the left the list on the right will be updated with common choices for that category. Selecting from the list on the right will result in the Width, Height and Units fields being updated. The Units drop down box offers three choices, Pixels, Inches or Millimeters. TwistedBrush Pro Studio as in any bitmap (raster) image editing software internally uses pixels as the measurement of the image. Inches and Millimeters are useful if you intend to print your image. The Resolution or Pixels Per Inch (PPI) need only be set if you are using Inches or Millimeters as a unit of measure or you intend to print your image. See the Understanding Pixels Per Inch (PPI), Dots Per Inch (DPI) and Image Resolution topic for more details. Here you will enter your image width and height in the unit of measure you have selected. The Swap button is a convenience if you need to swap the width and height values. This area is only of concern if you are changing the page size of a page that already has an image. See the section of Adjusting the Size of a Page topic. Press the OK button when done and the page will be set to the configured size.